The LGBT Basketball group is so much fun. It’s hard to pinpoint exactly what it is that makes me feel safer, more accepted or more welcome at this group as I think a number of things contribute to it. Taking part in sport requires confidence and my confidence gets stronger the moment I turn up to the group. Whilst my sexuality is barely mentioned, I get this buzz from being around other LGBT people, like a quiet recognition that we have something in common. As we often socialise after the session I can also chat about my wife and what’s going on for me in my life, without feeling like I’m in the minority. I have years of experience of enduring ‘locker-room banter’ about boyfriends, people’s social and love-lives and I can be part of that now, whilst being completely myself. We’ve also had several trans players join the group, and they have told me that by just seeing the ‘LGBT’ written in our name, they expected the group to be safe and inclusive. One person in particular talked about how impossible it felt for them to go along to a ‘men’s’ group, feeling so much smaller and less masculine than the people they’d expect to see. At LGBT Basketball, all genders are welcome and we love it that way. It makes the game more interesting, more inclusive and closes the divide between genders in sport. Having the sessions based locally makes them feel really accessible and I particularly enjoy getting use out of a multi-purpose community centre. We turn up just after the kids’ Karate sessions and just before the local men’s 5-a-side team meet. Other groups and activities are going on alongside and around our group sessions, making them feel normal, and a fully integrated part of wider community life. 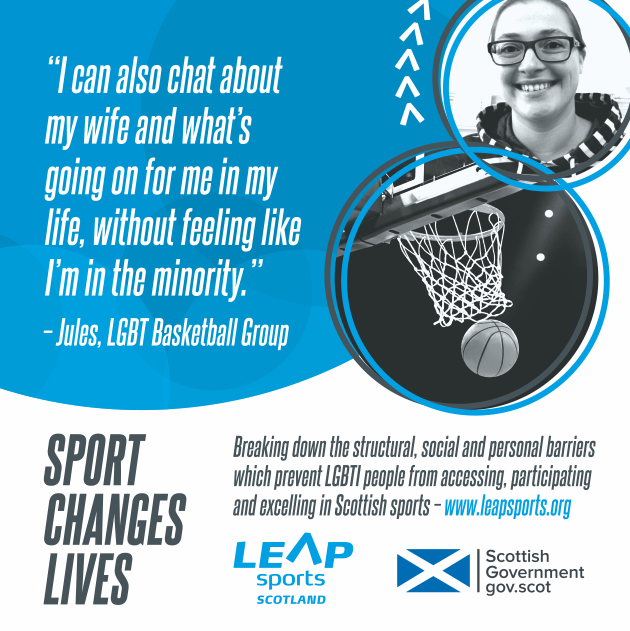 The LGBT Basketball Group is a friendly and informal group for beginners and players alike. We do basic drills and enjoy friendly games to build our skills and confidence. You are welcome along, whatever your fitness level. The group is based in Leith, Edinburgh and you can get in touch with us here: thesonics@hotmail.co.uk. Written on 14th January 2017.